“Base Camp Las Vegas: 101 Hikes in the Southwest” by Deborah Wall is an invaluable resource guide for hikers and outdoor enthusiasts of all activity levels. Wall is a recognized expert in the field, hosting a popular column on hiking and other activities and as a contributor and writer for many travel sites and publications. First published in 2010, “Base Camp Las Vegas” quickly became the bible for hikers interested in journeying the area. 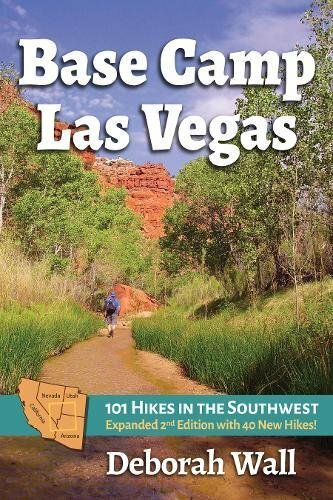 “Base Camp Las Vegas: 101 Hikes in the Southwest” is the updated and expanded edition of that book. The guide focuses on trails located in the 4-state region of Nevada, Utah, Arizona and California, specifically the landscape easily accessible from the Las Vegas area. My husband and I are relatively “newbie” hikers, with a few trails under our belts in Colorado and New Mexico, so I was eager to get my hands on this book and soak up everything Wall had to offer in this amazing guide. The book begins with a section called Before You Hit the Trail, and contains practical sound advice for preparing for an outing. Details ranging from what your should wear, items to carry in a day pack, weather considerations, and water consumption, to tips about hiking with children and what to do in case of an encounter with certain wildlife creatures – such as rattlesnakes! From there the author dives straight into specific areas and trails. Having completed each one of the hikes at least once, Wall relays her first-hand knowledge providing comprehensive details about each hike, including the best season to visit, the length and difficulty of the hike, elevation data, specific trail warnings and directions. This is vital information as knowing ahead of time allows for proper planning, and hikers will benefit greatly from the learned experiences of the author. I particularly enjoyed reading about the historical significance of many of the areas, including the claims to fame and how each area got their names. Aside from the wealth of information found inside these pages, it is an absolutely beautiful book as well. An accomplished photographer, Wall also includes page after page of STUNNING photographs of each area. The views that jump off the pages are enough to make you want to gather your gear and head out – immediately! Truly a high quality production in every aspect, there are so many things to love about this guide. Having read through it once, I am now eager to go back to the many pages I’ve bookmarked so I can research and plan our next trip. I will however, have to wait for my husband to finish reading it – he grabbed it as soon as I put it down! I highly recommend “Base Camp Las Vegas: 101 Hikes in the Southwest” by Deborah Wall to anyone interested in hiking, camping or just learning more about the area.